Are you learning a new language? You would understand that it is an art to translate a sentence into another language. However, we see major translation blunders everywhere! It is embarrassing as well as funny to read the translation services failures. We have listed the 10 Hilarious Spanish-English Translation & Spanish to English Translation Services Failures, which will make you laugh. If you are a native or you are learning Spanish, you will be able to point out the major translation slip-ups. Through this article, you will get to know why you need the best Spanish to English Translation services! Read on to find out! When translating from English to Spanish, you need to have a trusted source. It is always good to hire a professional translation services company in order to get the accurate translation. 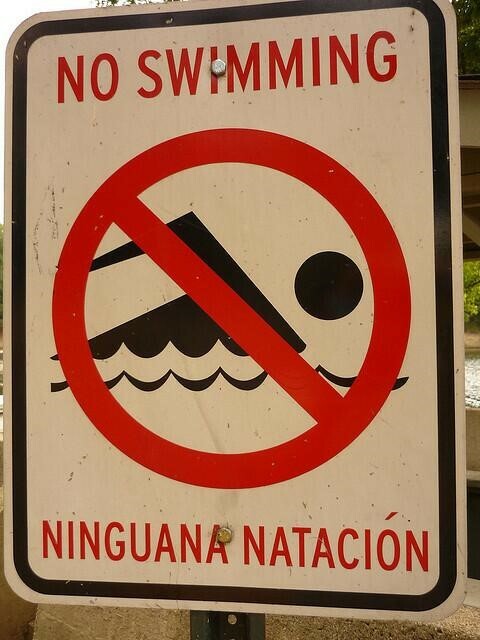 ‘Ninguana Natación’ literally means ‘None swimming’, which makes little sense. Also, the word is ‘Ninguna’ and not ‘Ninguana’. 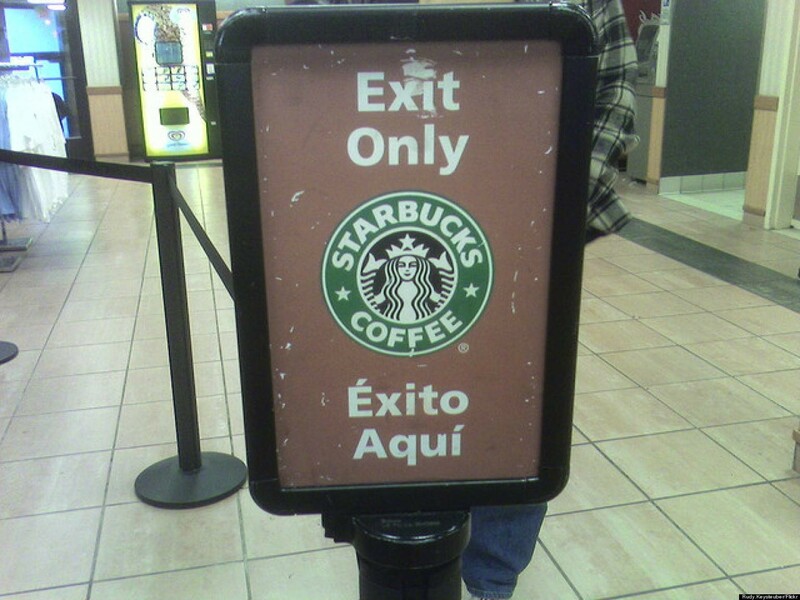 ‘Éxito’ literally means ‘success’ in Spanish. ‘Aquí’ can be translated as ‘here’. We wonder how you can get success at Starbucks Coffee. ‘Salida’ is the word used for ‘exit’ in Spanish. This is really funny! The list is getting funnier with the horrible translation errors! There is a word for driver in Spanish! ¿Como se dice driver in Español? ¡Conductor! Are you getting the point? Imagine a Delivery boy reading this and he is very good at Spanish, and knows a bit of English. How will he understand this ad? 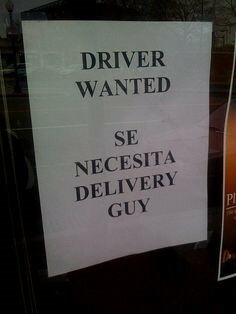 It is highly likely that he applies for this job assuming it is for a Delivery Guy. We can only see two words which make sense here! Those words are, ‘Por Favor’ and ‘Gracias’. Vuelta means return and Lejos means far. A funny thing here is that ‘chaparrones’ means ‘rainstorm’ or ‘downpour’ (i.e. ’shower’ in the sense of an intense and short rain). Why couldn’t they use the word, ‘Cerrar’? This is probably the funniest English to Spanish translation we have ever seen! The sentence should be, ‘Prohibito el paso’. 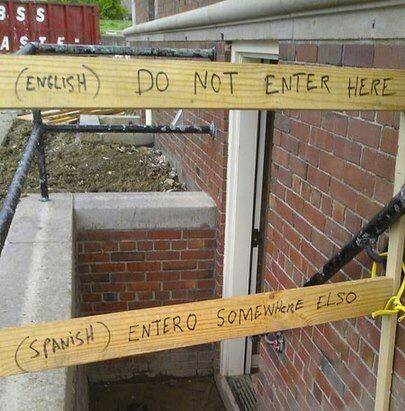 ‘Entero’ in Spanish means ‘whole’ or ‘entire’! It is hilarious to see this translation. ‘El Ningun’ means, ‘The None’. 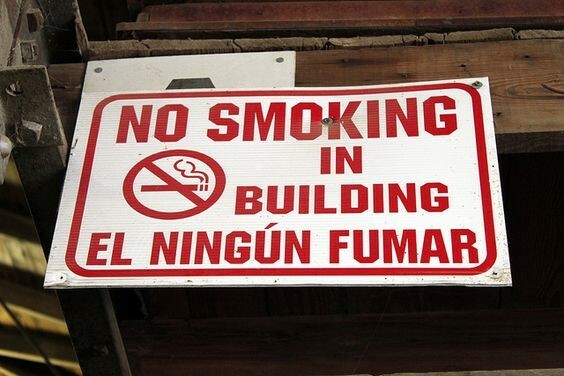 One could just say, ‘Prohibido fumar en este establecimiento’. It is simple that way! You DO see the need to opt for professional translation services because, if it is not done properly, it just sounds and looks funny. ‘Estimado Cliente’ literally means, ‘Dear Customer’ in Spanish. The English used for this is hilarious. 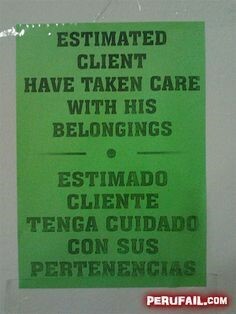 The actual meaning of the Spanish text is ‘Dear Customer, take care of your belongings’. There is something horribly wrong with the Spanish to English translation service here! The Spanish version ‘agua para riego de plantas’ (English: The water is for watering plants) is not translated! 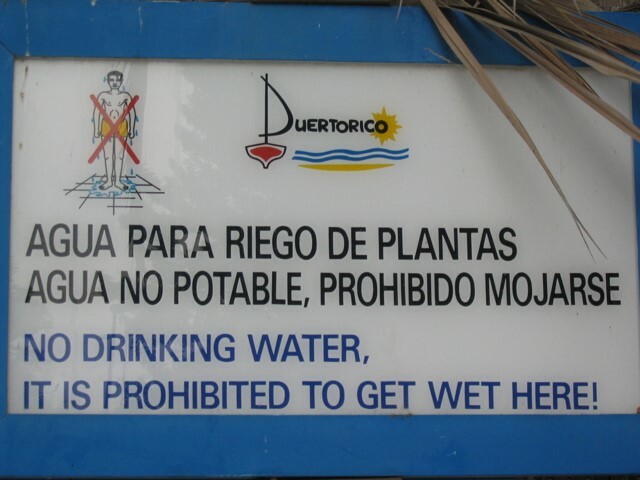 Moreover, ‘Agua no potable’ means “non-potable water” and not ‘no drinking water’. ‘Prohibited to get wet here’ also sounds a bit literal. These are some serious errors! 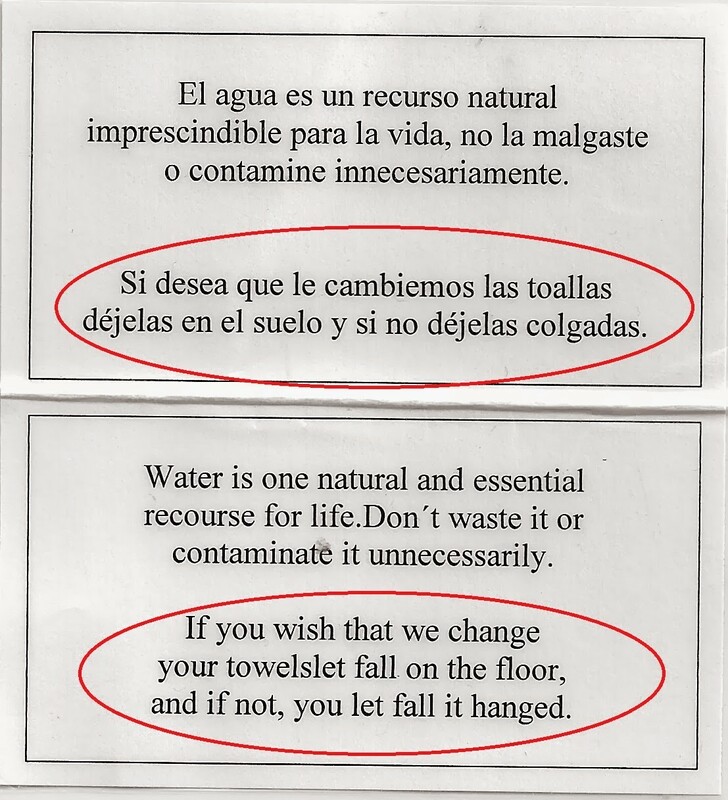 As you can see, the English used for the second sentence is horribly wrong!The correct translation would be ‘If you would like to change your towels, leave them on the floor; if not, leave them on the hangers’. There is another error in the first sentence, ‘recurso’ means ‘resource’.It is hilarious and disastrous at the same time! Why do you need to hire professional Spanish to English Translation Services? It is important for you to hire a company which offers professional Spanish to English Translation services because they will be able to provide you with accurate translation. Seeing the above mentioned hilarious translations, you wouldn’t want to take the chance! It is time to hire professional Spanish to English translation services in order to get accurate results and save oneself from the humiliation caused by hilarious translations! Want To Make Your E-Wallet More User Friendly?